We all know the web-crawler’s signature look – lanky, with giant googley eyes and (sometimes) webbed armpits. Regardless of who’s portrayed him in the films – Tobey Maguire, Andrew Garfield, or Tom Holland, he’s still got the same, identifiable look. Even the animated versions of Spider-Man follow the same basic look of Spider-Man, like the upcoming animated version of Spider-Man: Into the Spider-Verse. Now, if you’re a Spider-Fan, then you’ll know that several different people have taken on the mantle of Spider-Man before. There’s Peter Parker, the most famous version of Spider-Man around. Then there’s Ben Reilly, his literal clone; Miles Morales, who appeared in the Ultimate Spider-Man comic; Gwen Stacy, his on and off again girlfriend who is Spider-Gwen in an alternate reality; Otto Octavius, better known as Dr Octopus, who became Spider-Man for a while after a body swap with the original; and Peter Porker. Peter Porker? Yep, that’s not a typo – that’s the identity of an anthropomorphic pig who becomes Spider-Ham in an alternate universe. He has the proportions of a pig standing on its hind legs, which is absolutely adorable to see. Spider-Ham isn’t the only cute version of Spider-Man out there – true believers will know that there are many, many more versions of Spider-Man than the ones listed above. Here are the five cutest ones – which is your favourite? The aforementioned Spider-Ham will be appearing in the upcoming Spider-Man: Into the Spider-Verse film as one of Spider-Man’s inter-dimensional allies, but did you know that he was created 35 years ago? He first debuted in 1983 as a funny parody of Spider-Man. The Earth he lives in is Larval Earth (Earth 8311), where anthropomorphic (humanoid) animals reign instead of humans, and this isn’t even his first animated appearance! Spider-Ham (secret identity: Peter Porker) also appeared in the Ultimate Spider-Man animated series, when Spider-Man was traversing different dimensions in search of the Green Goblin. Needless to say, Spider-Ham has grown incredibly popular – there was even a toy of him released this year! If you’re a Simpsons and Spider-Man fan, then you’ll remember the epic convergence of fandoms in The Simpsons Movie in 2007, where Homer Simpson adopts a pig and proceeds to become completely obsessed with it. He even makes it crawl on the ceiling (like how Spider-Man is a wallcrawler), singing a version of the 60’s Spider-Man cartoon theme song as he does so – Spider-Pig. In true Simpsons fashion, they went all the way with this gag – Hans Zimmer wrote a choral version of “Spider-Pig”, which was played during the credits. Those were amazing times. If you were a fan of the Ultimate Spider-Man series, then you probably loved their anime-style asides and monologues. Being a Spider-Man series, Peter Parker often faced moral dilemmas – which were represented as an “Angel” Spider-Man and “Devil” Spider-Man, each coaxing Spidey into a certain decision. Since Spider-Man’s costume is red and blue, each “conscience” Spider-Man took on a different colour – blue for the Angel Spider-Man and red for the Devil Spider-Man. But they were drawn with cute, super-deformed proportions – look at that giant head and those stumpy limbs! Needless to say, the Devil Spider-Man often won in arguments, resulting in many nasty situations for our hero. They would speak in squeaky, Chipmunk-y voices as they vied for Spider-Man’s attention. While we all knew that Spider-Man would make the good, responsible decision in the end, we also realised that he could be tempted into making some terrible (but convenient) decisions as well. It was a pity that they never got made into plushies, though. The Superhero Squad Show was an animated Marvel Universe series for kids – so all the characters were drawn in the super deformed style, and their defining characteristics were exaggerated for comic effect. 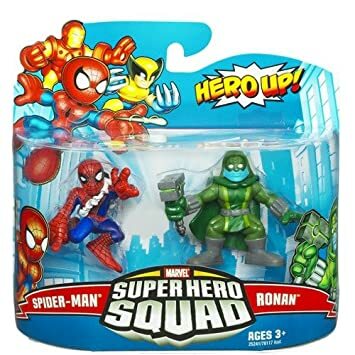 Of course, there was an accompanying toyline for the show – who could resist buying Superhero Squad figures? Due to rights issues, Spider-Man didn’t manage to get into the Superhero Squad Show – but he did make it into the Superhero Squad game! As a homage to Superhero Squad, Ultimate Spider-Man had a brief cameo scene of them – which was where we finally saw Superhero Squad Spider-Man! Those heads! Those feet! But they’re so cute. If you’re itching for some Spider-Man action while waiting for Spider-Man: Far From Home to come, then Spider-Man: Into the Spider-Verse is the perfect cure! This animated feature sees the Miles Morales version of Spider-Man (voiced by Shameik Moore) teaming up with Spider-Men from all over the universe to face a grave and terrible danger. But can he juggle his civilian life with his superhero duties as Spider-Man – or will his teenage life turn into a wreck because of his superheroics? For true Spider-Fans, you’ll want to catch the film two weeks before anyone else at the Kids’ Party: Spider-Man: Into The Spider-Verse! Not only will you get a Spider-Man badge and a Spider-Man figurine plus a Kiddie Popcorn Combo (1 x 32oz popcorn & 1 x 16oz drink), but you’ll also get to enjoy Spider-Man themed events like a DIY Spider-Man foam mask making, air brushed tattoos, Spider-Man themed caricature booths, a photobooth and a whole bevy of Spider-Man cosplayers! Kids’ Party: Spider-Man: Into The Spider-Verse not just a party for kids – but a party for anyone who likes Spider-Man! What’s happening at the event: Spider-Man themed caricature booth (very limited slots available, availability is based on first come, first served basis on the day itself), Spider-Man foam mask making, movie-themed air brush tattoo, photobooth, cosplay. The price of the ticket includes 1 Spider-Man badge and 1 x Spider-Man figurine, 1 kiddie popcorn combo and a 16oz drink. Are you ready to go Into the Spider-Verse?